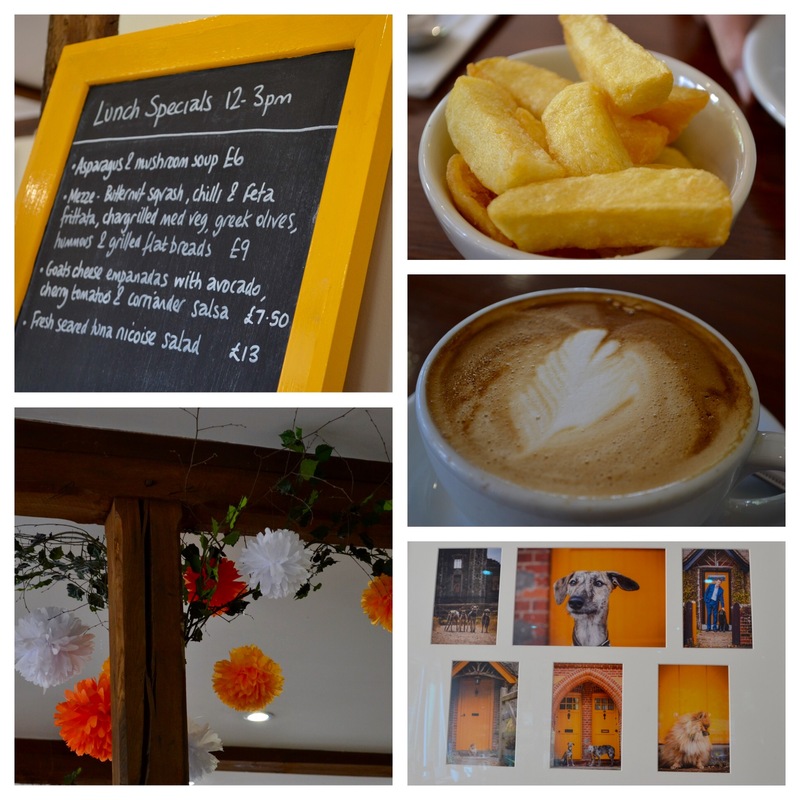 My husband and I have visited the Cowdray Farm Shop & Café in the historic town of Midhurst, West Sussex twice for lunch within the last month and we’ve enjoyed both visits. 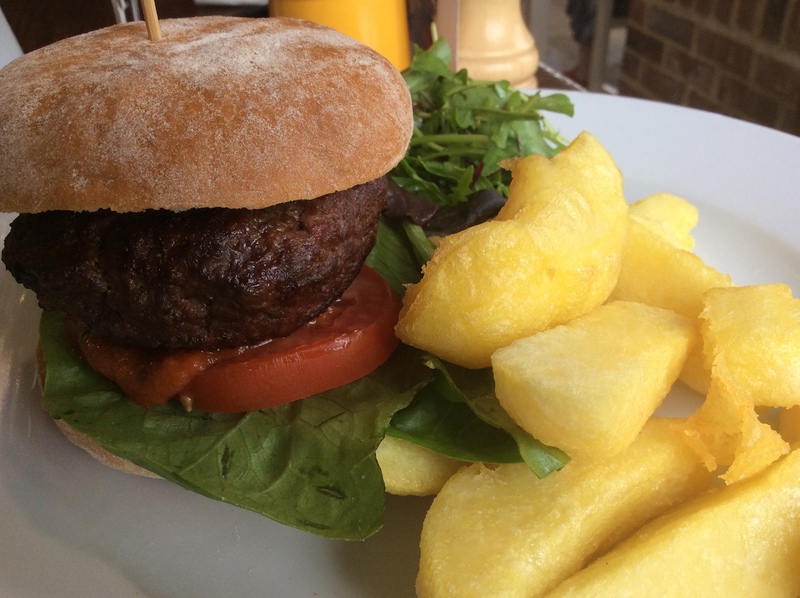 The staff are very friendly, it has a nice ambience and more importantly, the food is good too. 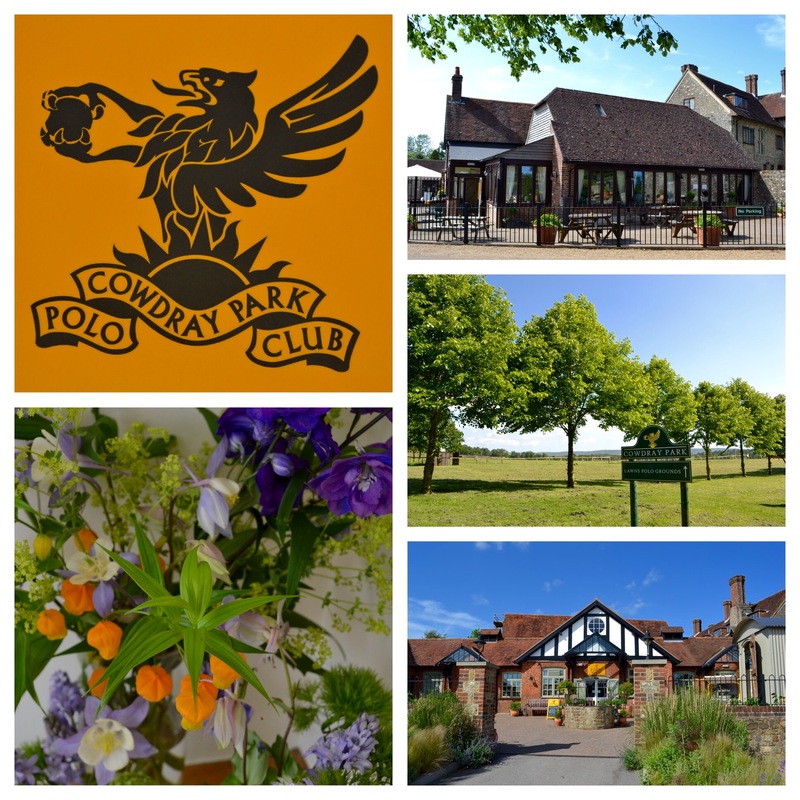 Cowdray Park which is where the farm shop & café are located, is famous for being the home of British polo. Just up the road are the ruins of the Tudor Cowdray House which are worth a visit. The Cowdray Estate goes back over a hundred years and manage forests and farms in a holistic approach, meaning they care about the land. Many properties on the estate are painted with the same distinctive ‘Gold Cup’ yellow. 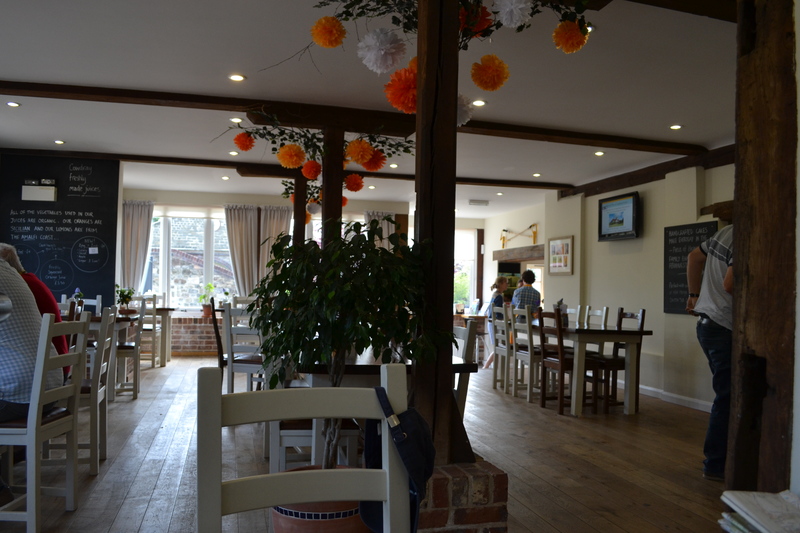 Inside the café it is light and fresh, wooden beams on the ceiling with bright paper flowers decorating the supports, fresh flowers upon the tables and small pots of orange and lemon trees on the window sills. I enjoyed a refreshingly cool glass of Viognier and Geoff a bottle of Hip Hop real ale from award-winning Langham Brewery in Lodsworth, not too far away. They have soft drinks available of course and a few organic juices such as Zing & Zest which contains ginger, celery, carrot & apple. 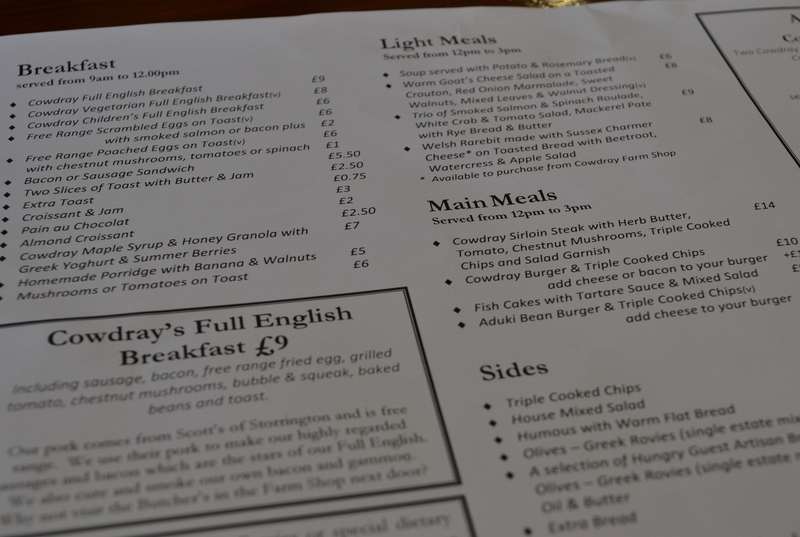 There’s plenty to choose from on the menu, breakfast until 12pm, sandwiches, burgers, salads, cakes, plus a specials board. 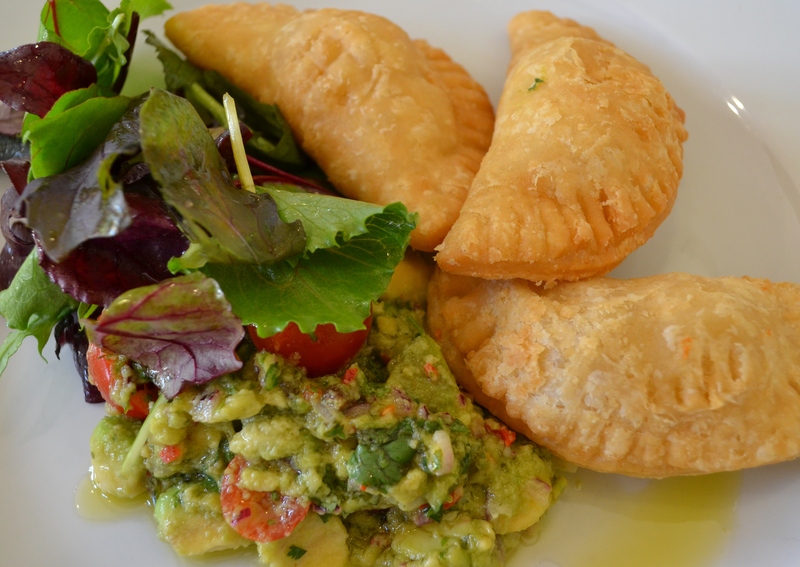 On this occasion I chose the goat’s cheese empanadas with avocado, cherry tomato & coriander salsa. 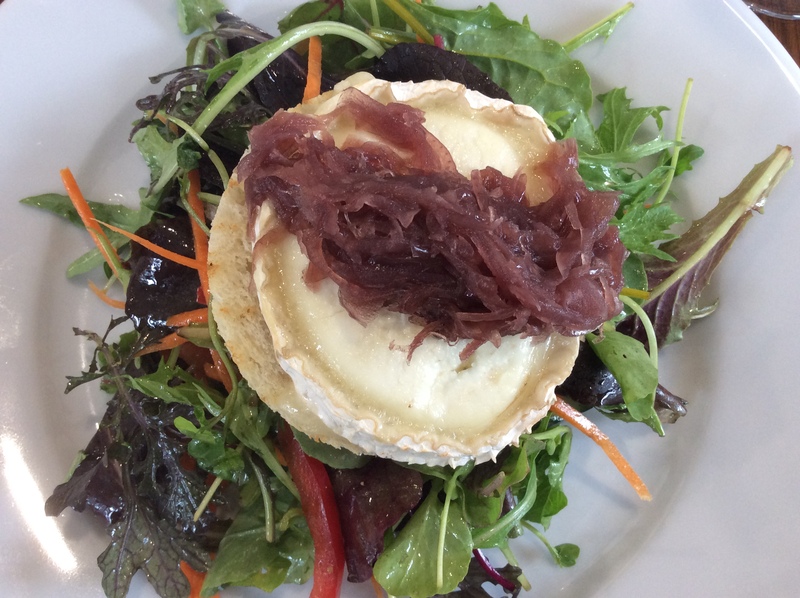 The pastry tasted fresh and light with the goats cheese in the centre. The salsa was especially nice, very colourful and bursting with flavour. 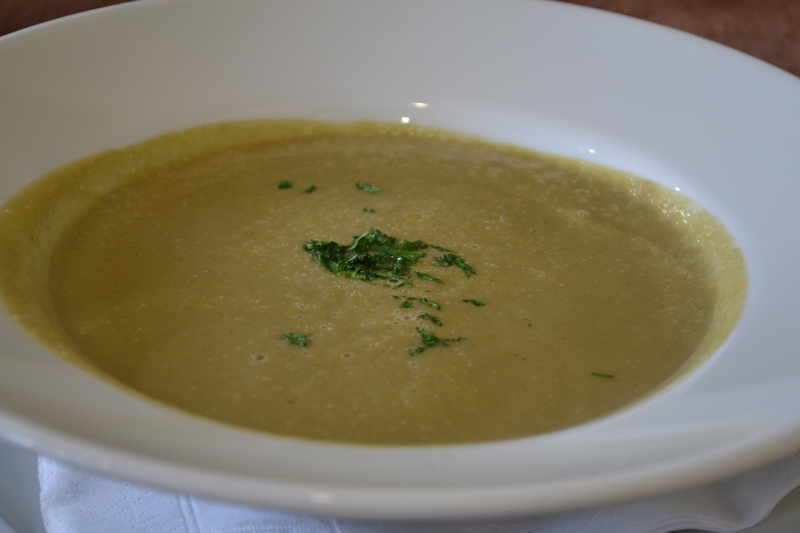 Geoff enjoyed the soup of the day which was asparagus & mushroom, served with a thick wedge of brown bread and butter. For dessert I had a slice of pear, almond & pistachio cake which was made by Piece of Heaven in Haslemere. 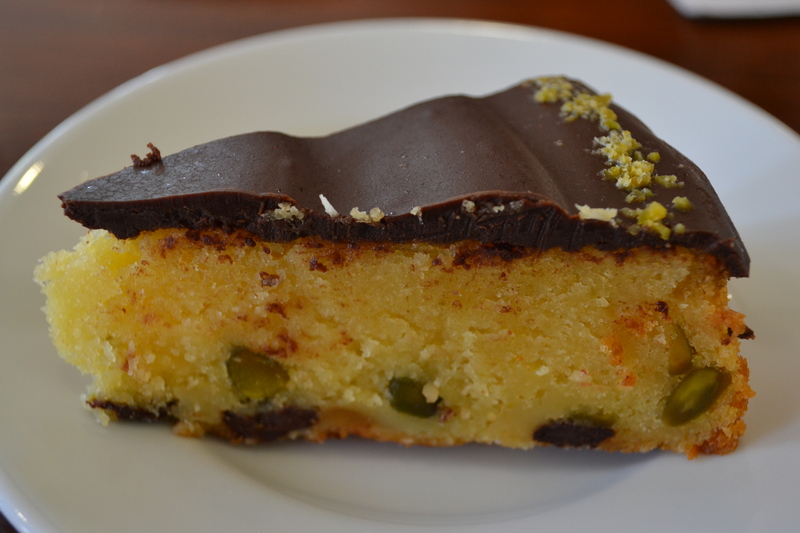 A nice cake with a hard chocolate top and although I couldn’t taste either the pear or the almond it did have plenty of pistachios in it. 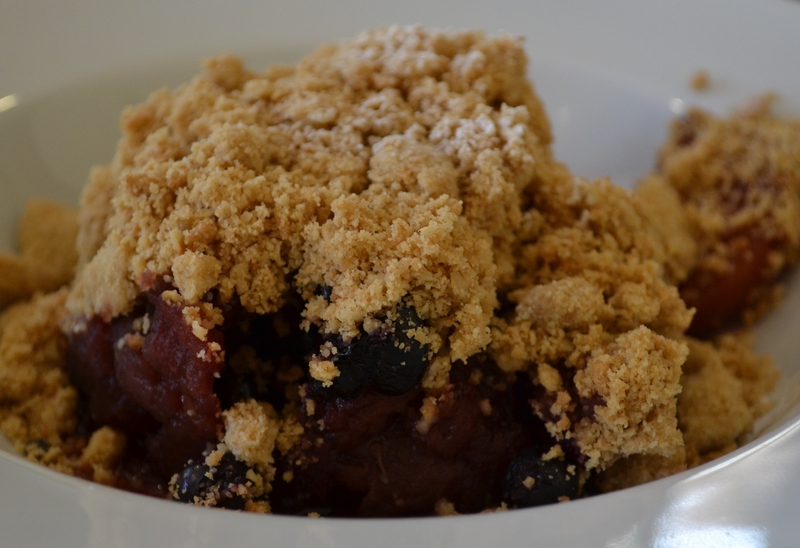 Geoff had the fruit crumble with custard. The flat white I had was very nice, nice enough for me to ask what coffee it was. It turned out to be Monmouth coffee which I’ve had before at The Laughing Gravy in London. On that occasion I had an espresso which I found to be quite bitter. We popped into the farm shop next door which has grocery items, fruit and veg’ from the Cowdray Estate, cheese, jars of pickles and jams, stationary and gifts. I bought a box of Rude Health‘s brown puffed rice which I’m now hooked on. 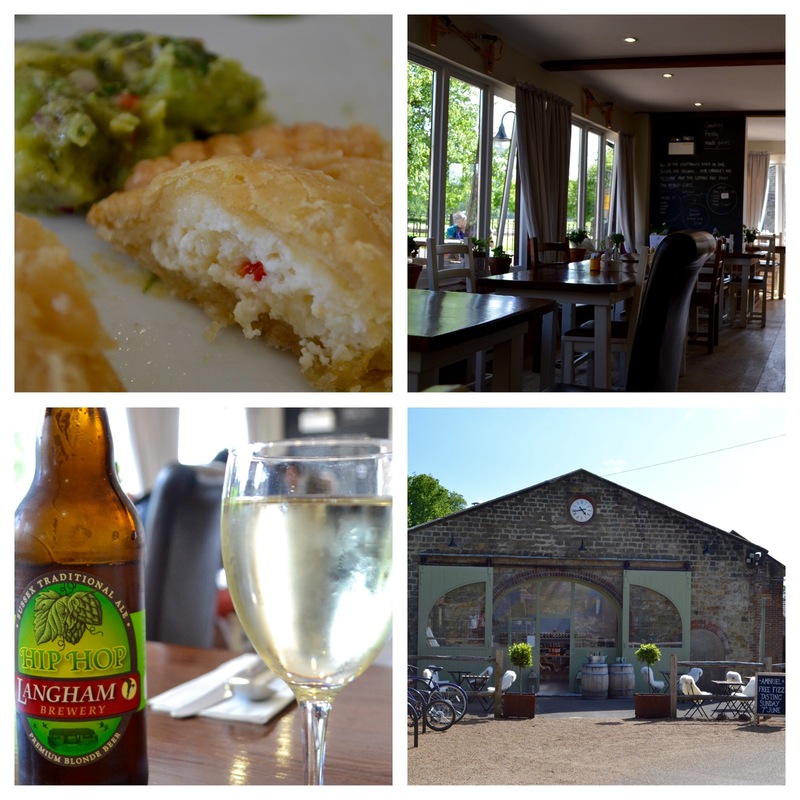 Also in the courtyard is The Exceptional English Wine Company which we went into and had a taste of some of the local wines, many places of which we recognise as we cycle past them quite regularly. On our second visit it was a busy Sunday lunchtime and we had to join a short queue but were sat quite quickly and also had a choice of several tables. I forgot I’d had goat’s cheese on my last visit and chose it again but this time a different dish, Warm Goat’s Cheese Salad on a Toasted Crouton, Red Onion Marmalade, Sweet Walnuts, Mixed Leaves & Walnut Dressing. Geoff had the beefburger and although he enjoyed it he did say that it was only average plus it was hard to cut as the knife didn’t have a serrated edge. The chips were very nice. 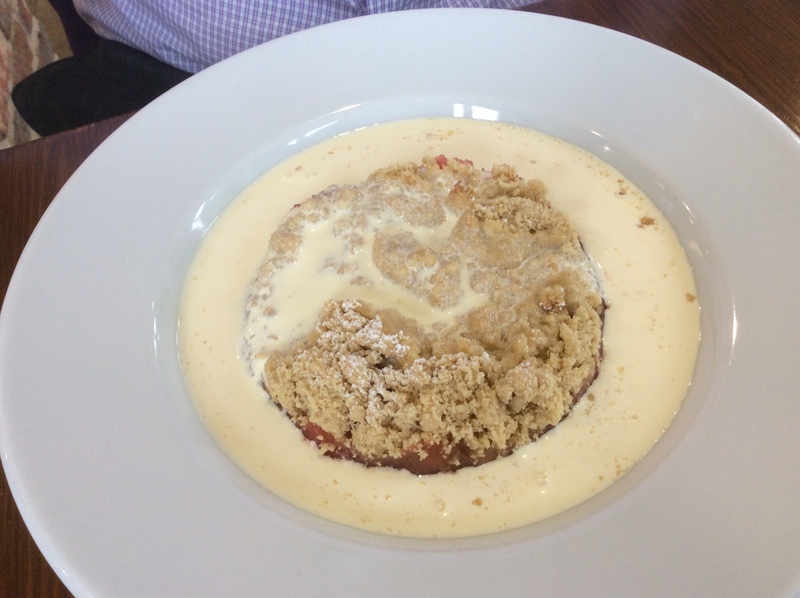 For dessert Geoff had the crumble again, this time with cream. I went for cheese overload and had the Cowdray Park cheese board with a selection from Neal’s Yard Dairy which was beautifully presented and reminded me of Southsea’s Cheese & Cheers. 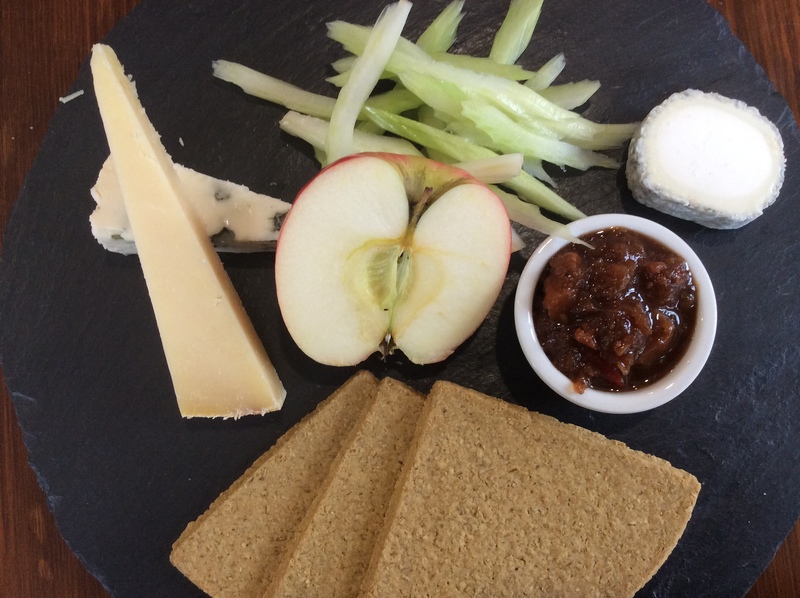 This dish contained three large oatmeal biscuits, half an apple (which I couldn’t cut as my knife didn’t have a serrated edge either) three cheeses, a Roquefort, a cheddar and the third escapes me, all very tasty. I wasn’t too keen on the chutney I’m sorry to say, it reminded me of Christmas spices which I’m not so keen on, cloves perhaps? A nice onion marmalade like the one on my main dish would have been more to my liking. I’m simply loving Stokes’ red onion marmalade at home at the moment and also their sticky pickle is nice too. We had another look around the farm shop and bought some more puffed rice as this seems to be the only place I can find it, a good excuse to return again and again of course 😉 . We took home a slice of millionaire’s shortbread to share later that evening and it was so lovely and gooey I wished we’d bought one each. I also purchased some chocolate by Noble & Stace, another local business. The truffles were disappointing but I did enjoy their salted caramel & honeycomb tablette.